This small collection of photographs comes from a land Las Vegas wants to drain and the military wants to bomb. 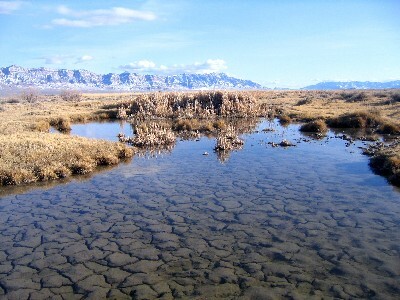 It's known as the West Desert and lies along the border of Utah and Nevada. 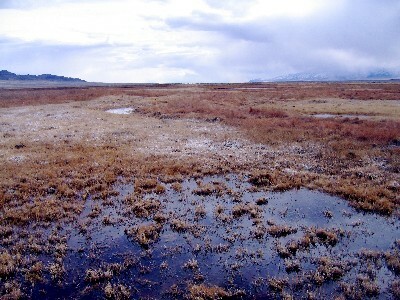 This is a stark land where falling rain doesn’t reach the ocean, instead flowing inland to form small salt seas, ponds, and marshes. Paved roads are rare and so are people. These shots are taken in the basins between mountain ranges, where water pools, dries, and cracks the earth, then pools again as the snow melts from the 12,000-foot mountains. The time of year is early march; temperatures fall below zero in the basins and hardly rise above that in the ranges. This is a land wearing names like Desolation, Confusion, Wah Wah, and so on. Herds of antelope can be seen as well as golden eagles and burrowing owls. Joel's short stories Mimes and Why Not And Only If are available at VerbSap.